The illusive Dover dress debunked. 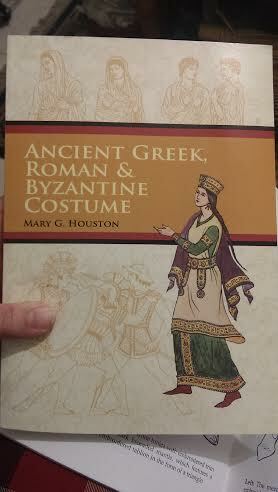 I can’t tell you how many times I’ve seen people emulating this look from the “Byzantine Fashions” Dover Coloring Book by Tom Tierney and “Ancient Greek, Roman, and Byzantine Costume” by Mary G. Houston. First of all, I want to say I have no issue with the images presented by Dover. 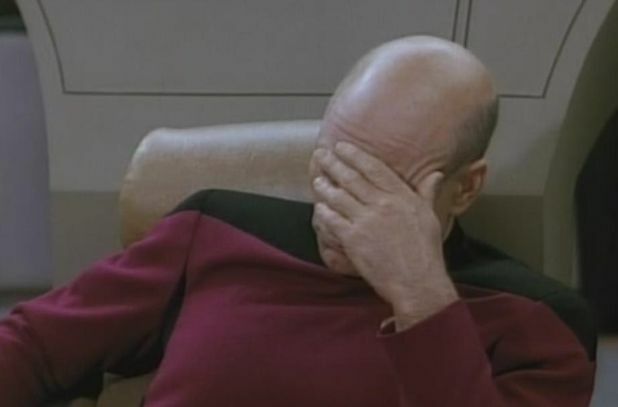 They usually do a good job, but they have a hard time backing up their sources. When asked about that particular clothing style, especially the belt, I had no idea what their source was, and upon asking others, I got a lot of shrugs and odd statements such as, “Oh, the book says it’s a princess/prostitute/ancient Roman goddess.” Which only led to me getting more confused. 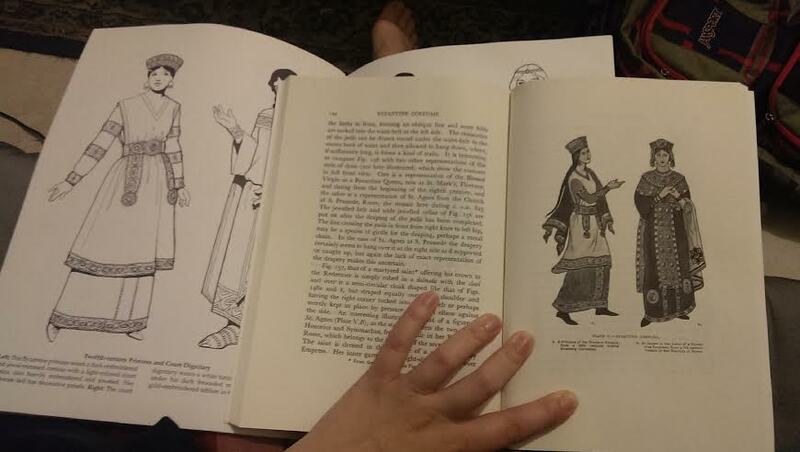 I’ve had the Tierney books for a while, both “Byzantine Fashions” coloring book and the paper dolls of Justinian and Theodora, which are adorable. They do provide a pretty solid idea of Byzantine styles based on artistic record. So don’t knock them, but don’t run off with them as a primo source, either. 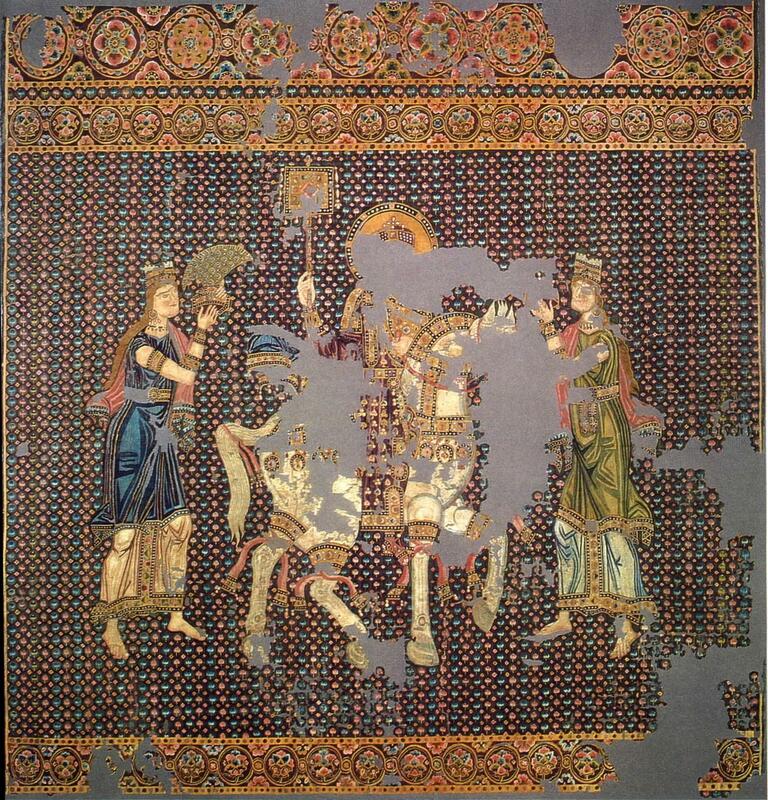 The so-called “Bamberger Gunthertuch“, a Byzantine silk tapestry depicting a Byzantine emperor on his triumphant return from a campaign. He is crowned, bears the labarum and rides a white horse. Originally identified as Basil II (by A. Grabar), it is now accepted that he represents John I Tzimiskes on his return from the campaign against the Rus’ in Bulgaria. He is flanked by two female tychae, who personify Constantinople’s two demoi, the Blues and the Greens. The one on the right offers [possibly] a crown, and the one on the left a triumphal toupha headdress. The silk was acquired by Gunther, bishop of Bamberg, in 1064-5, and re-discovered on 22 December 1830 in his grave. The silk is now on display in the treasury of the Bamberg Cathedral. Well, there you have it. They aren’t princesses, they’re political parties. You’re looking at an insanely simple garment. Almost tabard-like in nature, with minimal decoration. The ones depicted by the ladies in the textile fragment only have trim on the bottom, and it’s short enough to show off ornately decorated tunicae underneath, which seemed to be a popular look. This would explain the heavily gathered appearance on the Bamberg piece. After trying a stola for myself before, I can see why women would rather opt for the look portrayed in the Dover books, it’s a lot more flattering. Yeesh.